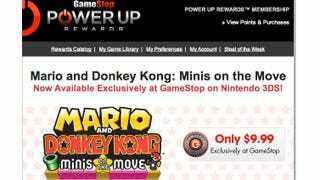 Another handy Power Up Rewards e-mail from GameStop arrived in my inbox today. A game that you can download to your 3DS without going into a store is "exclusively at GameStop." GameStop isn't even selling it for an exclusive price. Does anyone in gaming use the word exclusive correctly? It&apos;s the Fifth Game of Another Mario Sub-Series! Let&apos;s Take a Tour.